You don't have to live in the low desert to hear of flash floods. Prescott has its fair share of areas marked “Do not cross when flooded.” Mosaic Insurance would like to remind Prescott drivers to be aware of the perils of flash floods which led to Arizona's Stupid Motorist Law. Catastrophic flash floods don't come with a warning. That's why they're called 'flash floods'. Most people living in Arizona may not be personally familiar with them, but we've all seen news stories covering the terrible and unexpected losses. Thankfully our local police, fire and other emergency responders are quick to anticipate the danger and reduce the risk to drivers by establishing barricades and signs that warn of the danger. But why would anyone drive around or through barricades meant to protect them? Sometimes drivers will see someone else cross a barricade and make it through, sometimes it's inexperience and sometimes, sadly, it's just stupidity and refusing to obey the warnings not to cross. Thanks to Arizona's 'Stupid Motorist Law', defiant and inattentive motorists who insist on driving around or through barricades and who ignore warnings not to cross flooded roads and washes can expect to be financially responsible for the cost of their rescue. If you see a flooded roadway, stop and turn around. 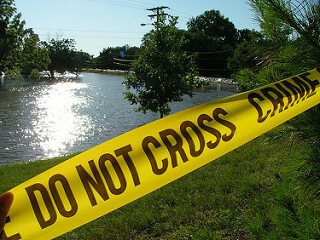 Flood waters are swift and you have no way of estimating the power of rushing water. People who drive into flooded areas often end up losing their vehicle and its contents. Some even lose their lives. Mosaic Insurance wants Prescott drivers to stay safe and sound. Be sensible. Obey warnings. If you see a flooded roadway after a storm, find another way to your destination. And, even though you are a responsible driver, the hazards of flash flooding might still damage your vehicle. For an auto insurance review and to make sure you are fully protected, call Mosaic Insurance today at 928-458-7374.